La empresa Henschel comenzó el desarrollo del Tiger I en 1937. La producción en serie comenzó en 1942 con un total final de 1354 vehículos fabricados. El tanque entró en combate por primera vez en la batalla de Leningrado y los Tiger estuvieron en las batallas del frente desde Túnez hasta Kursk. Aunque se dejó de fabricar en el verano de 1944, el Tiger I siguió luchando hasta el final de la guerra. The Tiger I is a German Tier VII Heavy Tank. The Panzerkampfwagen VI Tiger Ausf.E, better known as the "Tiger" tank, was a legendary tank on the battlefields of WWII, able to defeat virtually all Allied armor fielded against it. It proved to be a considerable menace to allied vehicles such as the American M4 Sherman and Soviet T-34, the two most widely used Allied tanks. A total of 1,347 vehicles were produced from August 1942 through August 1944. The Tiger I boasts a highly accurate and well balanced top gun, which greatly helps mitigate it's relatively low armor values for it's tier and type. If played like a proper Heavy tank many will be left disappointed, however if it is played to it's strengths and played properly, the Tiger I is an exceptional tank. The Tiger I leads to the Tier VIII Tiger II. Many players consider the Tiger I to be a poor tank because it can not fill a frontline fighter role in this game like it could on the battlefields during WWII. Of course, the Tiger's main opponents during WWII were the M4 Sherman, T-34, and KV-1 tanks. It still dominates these vehicles within the game, but now it has to face opponents designed in some cases to match it or defeat it. The key to success with the Tiger is to disregard any preconceived notion that a Heavy has to be at the frontline, and adopt an aggressive Tank Destroyer type of role. At the start of a battle you should stay back and in a good position to snipe enemy tanks lit up by forward tanks, only moving up when you don't have targets, or an area needs some strong backup to prevent collapse. As the battle progresses, ensure you stay moving but out of the direct action while providing firepower from a distance with your guns. As the battle gets into a later stage, move all the way up and use your preserved hit points to be an effective late game Heavy. Done right, you will be inflicting damage all the way through the battle, and in the later stages, can become a proper Heavy and bully other tanks including other heavies, thanks to the hit points you preserved by staying in the back. A good tactic to use for avoiding damage in this tank, is to side scrape where possible. Proper side scrapping can see you bounce shot after shot without taking damage. Angling is also important, though for the Tiger this is more for the sake of keeping up a good habit, in truth you should expect to be penetrated by most everything you see while using this tank, so plan accordingly. German Doctrine - defining the basis for the heavy tank concept. German doctrine before World War II didn't clearly specify the parameters used to define a light, medium, or heavy tank. This lack of an exact definition of the role of each tank-type was a result of the inherent qualities of the tank as a weapons system operating in a combined arms force, and as such, its potential were not fully understood at the time. The same conceptual lack of a clear definition of the three generic tank-types also existed in the US, the UK, and the Soviet Union. What existed was a somewhat loose classification based on the weight of the tank and the doctrinal missions of each type. In face of that, what was generally accepted was that the light tank was to be employed in reconnaissance missions, which demanded great mobility but didn't require much armor protection or great lethality. The medium tank was to be used in exploitation or pursuit missions, requiring a different mix of mobility, armor protection, and firepower. To fulfill these requirements, medium tanks had to be fast and have a greater level of mechanical reliability, since those tanks needed to be able of conducting fast maneuvers necessary to exploitation or pursuit missions. Under this classification, heavy tanks were to act as support for the infantry and artillery, but the main purpose of the heavy tank was to penetrate the enemy's defenses, thus allowing the medium tanks to exploit the breakthrough. However, that classification also implied the assumption that the light and medium tanks could, to an extent, perform each other's missions. This was not possible for heavy tanks, as they wouldn't have the same degree of speed and the operational range of the other two types because of the greater weight, consequence(s) of the heavier weapons, and high degree of armor protection required for these tanks. In 1937, Guderian described the operational principles and tactics that would shape German thinking on how to employ armored formations in a future war. The mission of the heavy tank within this concept was to effect a breakthrough, and its first objective was to engage and destroy the enemy's anti-tank guns in the defensive line. The next objective of the heavy tanks was to destroy the enemy artillery, but Guderian correctly anticipated that the penetration of the defensive lines would force the enemy to throw his armor reserves in a counter-attack. About the importance of defeating this counter-attack, Guderian emphasized that the greatest enemy of the tank is another tank, and that because of that, the armored forces had to be capable of defeating this counterattack, or the breakthrough would fail. The German doctrine of that time focused mainly on the offensive. Naturally, when the tide turned against Germany, the doctrinal recommendation was that the armor formations would be kept back, and ready to counter-attack any breakthrough of the German defense lines. Consequently, the doctrinal mission of the Tiger was first and foremost, whether in the offense or in the defense, to kill the enemy's tanks. Understanding this way of thinking is fundamental to comprehend why the Tiger was developed and employed the way it was. Tiger I is the common name of a German heavy tank developed in 1942 and used in World War II. The final official German designation was Panzerkampfwagen VI Tiger Ausf.E, often shortened to Tiger. It was an answer to the unexpectedly impressive Soviet armour encountered in the initial months of the Axis invasion of the Soviet Union, particularly the T-34 and the KV-1. The Tiger I gave the Wehrmacht its first tank mounting the 88 mm gun in its first armoured fighting vehicle-dedicated version: the KwK 36. During the course of the war, the Tiger I saw combat on all German battlefronts. It was usually deployed in independent tank battalions, which proved to be quite formidable. While the Tiger I was feared by many of its opponents, it was over-engineered, using expensive materials and labour intensive production methods. Only 1,347 were built between August 1942 and August 1944. The Tiger was prone to certain types of track failures and immobilizations, and limited in range by its high fuel consumption. It was expensive to maintain, but generally mechanically reliable. It was also difficult to transport, and vulnerable to immobilization when mud, ice and snow froze between its overlapping and interleaved road wheels in winter weather conditions, often jamming them solid. In 1944, production was phased out in favour of the Tiger II. The tank was given its nickname "Tiger" by Ferdinand Porsche, and the Roman numeral was added after the later Tiger II entered production. The initial official German designation was Panzerkampfwagen VI Ausführung H (‘Panzer VI version H’, abbreviated PzKpfw VI Ausf. H), with ordnance inventory designation SdKfz 182, but the tank was redesignated as PzKpfw VI Ausf. E in March 1943, with ordnance inventory designation SdKfz 181. Today, only a handful of Tigers survive in museums and exhibitions worldwide. The Bovington Tank Museum's Tiger 131 is currently the only one restored to running order. Despite the decision to mass produce the Pz.Kpfw.III and IV, and the far certainty (at the time) that these two models would be adequate for the expected battles of the future, the German general staff also called for an even heavier tank in 1937. This was to be of 29.53 tons (30,000 kg) or more and was to be a heavy "breakthrough" tank to lead the armored assaults. The design lapsed until 1941, by when it was realized that the Pz.Kpfw.III and IV had been less successful than had been expected against the heavily-armored French and British tanks in 1940. This view was fully endorsed when the Soviet T-34s and KV-1s were met later in 1941, and resulted in a specification for a heavy tank capable of mounting the highly successful 88 mm high-velocity gun in a turret with full traverse and carrying sufficient armor to defeat all present and future anti-tank weapons. Two firms submitted prototypes, using some of the developments from the 1937 ideas. These were Porsche and Henschel. The turret was common to both and came from Krupp. It is interesting to add, at this point, that Hitler had demonstrated great interest in the Rheinmetall 88mm Flak 41 as the main gun of the Tiger I. This was an indigestable proposition for Krupp, which designed and built the Tiger I turret, to have to mount, in their turret, a gun developed by their arch-rival. In the end, events unfolded in such a way that the main gun of the Tiger I would be the 88mm KwK 36 L/56, as Porsche never asked Krupp for a turret with 200 cm of diameter (necessary to mount the 88mm Flak 41 on it), but ordered the production of 6 turrets with a 190 cm diameter, to mount the 88mm KwK 36 L/56. After the turrets production started, it was impossible to mount the 88mm Flak 41 on the Tiger I turrets. The official WaPrüf 6 designation to the Porsche prototype from 5 March 1942 was PzKpfw VI (VK 45.01 P) (Ausfürung P). The Inspekteur der Panzertruppen (In6) designation, specified for use in training, maintenance manuals, and in organization tables, was Panzerkampfwagen VI P (88 mm) (SdKfz 181) Ausfürung P. Suggested names were 'Tiger (P)', 'Tiger P1' or 'Porsche Tiger'. The Henschel prototype received the designation VK 45.01 (H). This Henschel model came into being as a rush job, quickly assembled from a mixture of components available from previous heavy panzer designs. Henschel was not originally involved in the 45 metric ton heavy-tanks project, as they had been tasked with the development of a 36 metric ton medium tank with 80 mm front armor, the designation of which was Panzerkampfwagen VI Ausfürung B (VK 36.01). To meet the demand that the production program was to start in 1942, the VK 45.01(H) was quickly created by redesigning the VK 36.01. A new feature was the Vorpanzer (frontal shield), which could be lowered to protect the track and drive sprockets. However, this feature was quickly dropped, having only been fitted on this Versuchsserie Tiger Nr. 'V1'. After tests conducted on 20 April 1942, the Henschel prototype was chosen for series production. The decision was based on a maneuverability test, and on the fact that the Henschel prototype was more conventional: cheaper and easier to produce than the extravagant Porsche design. At the time of its introduction, and for some time afterwards, the Tiger was the most powerful tank in the world. The 88 mm gun, which had 92 rounds of ammunition, was enormously formidable, and the armor ensured that any frontal shot could not penetrate. So effective was it that the Allies had to develop special tactics to deal with it. Production began slowly in August 1942. The last denomination is the one that is the official name for the Tiger I. So, it is either Panzerkampfwagen Tiger Ausf.E (Sd.Kfz.181), - Sd.Kfz. is the abbreviation for Sonderkraftfahrzeug (Special Purpose Vehicle, or Special Ordnance Vehicle, a classification used, beside other vehicles, for the Panzers), or Panzerkampfwagen Tiger Ausf.E, and thats the official designation until the end of the war. 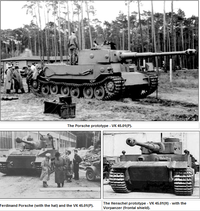 Walter J. Spielberger, in "Tigers I and II and their Variants" (Schiffer, 2007), cites a Führer's order, dated February 27, 1944, which abolished the designation "Panzerkampfwagen VI" and ratified the name Panzerkampfwagen Tiger Ausf.E as the official designation. With the exception of British guns, the data on the penetration tables above were extracted from a "Wa Prüf 1" report dated 5th October 1944, which relate the relative ability of the major opponents to penetrate the Tiger and vice versa. Data on British gun capabilities were extracted from British penetration test reports. The penetration ranges in the tables were determined for conditions in which the tanks stood at a side angle of 30 degrees of the incoming round. These tables should be used only for comparison of the relative vulnerability of the opponent's tanks. The data are not to be misconstructed as the absolute ranges at which the armor could be penetrated. There was a fairly large variance in both the protection offered by the same thickness of different armor plates and thickness penetrated by the same type of armor-piercing projectiles. Also, the ranges shown in tables above "are all approximations based on calculations using estimates of the capabilities of American and Russian guns and penetration numbers derived from German guns firing against German armor plate." The armor of the Tiger I was not well sloped, but it was thick. Here is where many fail to understand that, in terms of World War II tank warfare, thickness was a quality in itself, since armor resistance is mainly determined by the ratio between armor thickness and projectile diameter (T/d). The T/d relationship regarding armor penetration demonstrates that the more the thickness of the armor plate overmatches the diameter of any incoming armor piercing round, the harder it is for the projectile to achieve a penetration. On the other side, the greater the diameter of the incoming projectile relative to the thickness of the armor plate which it strikes, the greater the probability of penetration. This explains why the side armor of the Tiger I, being 80 mm thick, was so difficult to be penetrated at combat ranges by most Allied anti-tank and tank guns, whose calibers were overmatched by the thickness of the Tiger I armor. 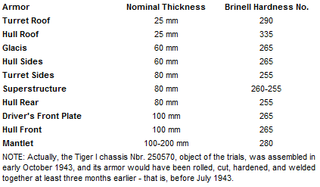 The rolled homogeneous nickel-steel plate and electro-welded interlocking-plate construction armor had a Brinell hardness index of around 255-280 (the best homogeneous-armor hardness level for the corresponding thickness level of the Tiger's armor, by WW II standards), and rigorous quality control procedures ensured that it stayed that way. About this issue, and according to Thomas L. Jentz, "there is no proof that substandard german armor plate was used during the last years of the war. 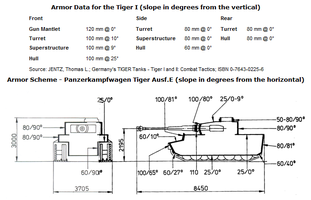 All original documents confirm compliance with standard specifications throughout the war" (JENTZ, Thomas L. Germany's TIGER Tanks, VK45.02 to Tiger II: Design, Production & Modifications). Moreover, in the same reference book, Jentz presents the data from a British testing of the Tiger's armor protection by firing different guns against it. The tests were realized in a place beside the the main road from Beja to Sidi N'sir in Tunisia, on May 19, 1943. The reports from these tests stated that the resistance of the Tiger's armor was "considerably higher than that of the British machineable quality armor. The side armor, with a thickness of 82 mm (nominal thickness was 80 mm) had a resistance equivalent of 92 mm of British armor" (Jentz, op cit, page 15). However, a little further, when addressing directly the issue of the Tiger's armor quality, the report states that "The armor plates (with exception of the hull roof plates) did not show any marked tendency to brittleness, and their behavior generally was not unlike British mechineable plates. 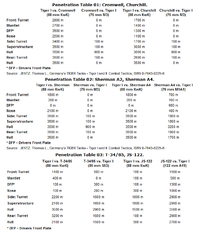 The following table gives a list of Poldi hardness, corrected to Brinell figures, taken at the surface of the armor". The Tiger, as a result of its intrinsic doctrinal mission, that is, to effect a breakthrough and to support medium tanks during the breakthrough by destroying enemy tanks, was (production-wise) a very expensive and resource-consuming tank. The nominal cost of a Tiger was 250,800 Reichsmarks. In contrast, a PzKpfw III Ausf. M cost RM 103,163, a PzKpfw IV Ausf. G RM 115,962, and a PzKpfw V Panther RM 117,100: all these figures are exclusive of weapons and radios. However, the final cost of the Tiger's production was even higher: around 300,000 Reichsmarks. Christopher W. Wilbeck, in "Sledgehammers: Strengths and Flaws of Tiger Heavy Tank Battalions in World War II", citing the Tigerfibel (the Tiger's manual), states that the final cost of the Tiger's production was much higher - 800,000 Reichsmarks, and 300,000 man-hours were required to produce one single Tiger. The Tigerfibel, in view of making those numbers more personal to the Tiger crewmen, stated that it was required one week of hard work from 6,000 people to produce one Tiger. It also stated that the 800,000 Reichsmarks figure was equivalent to the weekly wages for 30,000 people. As an added benefit, due to its resilience, when a Tiger was damaged and was subsequently destroyed by its crew, the crew frequently managed to escape capture and return to their unit, and this helped to create experienced crews. This benefit oviously came at a cost in other aspects, however. Another fact that helped the Tigers a lot was the "shatter gap" effect which affected allied ammunition, a most unusual situation where rounds with too-high an impact velocity would sometimes fail, even though their penetration capability was (theoretically) more than adequate. This phenomenon plagued the British 2 pounder in the desert, and would have decreased the effectiveness of U.S. 76mm and 3" guns against Tigers, Panthers, and other vehicles with armor thickness above 70 mm. It should be noted that the problems with the 76 mm and 3" guns did not necessarily involve the weapons themselves: the noses of US armor-piercing ammunition of the time turned out to be excessively soft. When these projectiles impacted armor which matched or exceeded the projectile diameter at a certain spread of velocities, the projectile would shatter and fail. Penetrations would occur below this velocity range, since the shell would not shatter, and strikes above this range would propel the shell through the armor whether it shattered or not. When striking a Tiger I driver's plate, for example, this "shatter gap" for a 76mm APCBC M62 shell would cause failures between 50 meters and 900 meters. These ammunition deficiencies proved that Ordnance tests claiming the 76 mm gun could penetrate a Tiger I's upper front hull to 2,000 yards (1,800 meters) were sadly incorrect. As a general rule, BHN (Brinell Hardness Index) effects shot shatter, and obliquity effects are related to the ratio between shot diameter and plate thickness. The relationship is complex, but a larger projectile hitting relatively thinner plate will usually have the advantage. There is an optimum BHN level for every shot vs plate confrontation, usually in the 260-300 BHN range for World War Two situations. Below that, the armor is too soft and resists poorly, above that, the armor is too hard and therefore too brittle. The 13. (Tiger) Kompanie, of Panzer Regiment Großdeutschland, reported on the armor protection of the Tiger: "During a scouting patrol, two Tigers encountered about 20 Russian tanks on their front, while additional Russian tanks attacked from behind. A battle developed in which the armor and weapons of the Tiger were extraordinarily successful. 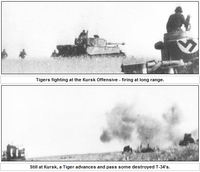 Both Tigers were hit (mainly by 76.2 mm armor-piercing shells) 10 or more times at ranges from 500 to 1,000 meters. The armor held up all around. Not a single round penetrated through the armor. Also, hits in the running gear, in which the suspension arms were torn away, did not immobilize the Tiger. While 76.2 mm anti-tank shells continuously struck outside the armor, on the inside undisturbed, the commander, gunner, and loader selected targets, aimed, and fired. The end result was 10 enemy tanks knocked out by two Tigers within 15 minutes"
All this considered, and analyzing the tables above, it stands clear that "based on opposing ranges, without considering other factors, the Tiger I had only been outclassed by the Russian Josef Stalin heavy tank with the 122 mm gun" (Again, JENTZ, Thomas L.; Germany's TIGER Tanks - Tiger I and II: Combat Tactics; op. cit.). It was said that it took at least five American M4 Sherman medium tanks to knock out a cornered Tiger. Whether it is fact or hearsay was not confirmed. However, its interesting to note that according to the kill/losses achived by the Tiger battalions, the overall ratio was 5.74 to 1 (WILBECK, Christopher W., op cit). When speaking about opposing ranges, it becomes necessary to take a look at another essential Tiger I feature: the KwK 36 L/56 8.8 cm gun. The 8.8 cm KwK 36 L/56 was an adaptation of the famous 8.8 cm Flak 36, which was a development of the Flugzeugabwehrkanone Model 18 (Flak 18). In informal German use, this gun was universally known as the Acht-acht, a contraction of Acht-komma-acht Zentimeter (8.8 cm = 88 mm), and was first used in combat by the Condor Legion, in Spain, where it earned the reputation of being an excellent anti-aircraft gun as well as a tank killer. This capacity would be confirmed during the French campaign in 1940, and most spectacularly in the hands of Rommel's Afrika Korps in North Africa. The Flak 36 was essentially a Flak 18 mounted in three sections, making it possible to change the part of the barrel that suffered the most attrition from the high-velocity rounds. By the time the Wehrmacht was heavily committed in Russia, it proved to be the only gun in the German inventory able to destroy the new T-34 and KV-2 Russian tanks at longer ranges. In 1938, the 8.8 cm Flak 18 was considered for firing against ground targets, specifically armored/concrete pillboxes and enclosures, and the armor piercing ammunition that would be in service from this time onwards consisted of the 8.8 cm Panzergranate weighing around 9.5 kg with armor piercing cap and ballistic cap with a high explosive filler of 160 grams. Muzzle velocity is listed as 810 m/s from the L/56 barrel of the Flak 18 and Flak 36/37. During early 1942, the penetration ability was improved with the introduction of the Pzgr.39 of 10.2 kg weight with a reduced HE filler of 59 grams. Muzzle velocity was 800 m/s. The early Blitzkrieg up to early 1942 saw the use of the large capacity Pzgr. with penetration at less than 100 mm at 30 degrees. The 88 mm Flak APCBC round, which fought the KV and T34 tanks during 1941 and early 1942, was less effective than the round fired by the Tiger's 88 mm KwK 36 L/56. Even the later 88 mm Flak round, with a large capacity high explosive filler (and 9.54 kg weight), penetrated from 8% to 23% less than the 88 mm KwK 36 L/56 APCBC round. In May 1941, the German general staff demanded a new Kampfwagen Kanone (Tank Gun) specification for the Tiger; it had to be capable of penetrating 140 mm thick armor at a range of 1,000 meters, without specifying that the caliber had to be 88mm. This specification was a direct consequence of Hitler's directive dated 26 May 1941, which stated that if the same penetration capability could be achieved by a gun of smaller caliber than 88mm, then preference should be given to the smaller caliber gun, based on the increased ammunition load and the lower turret weight. However, the same directive stated that the chosen caliber must be adequate to engaging tanks, ground targets, and bunkers. This resulted in Rheinmetall receiving a contract in mid-July 1941, to design a turret with a gun that fulfilled those requirements. The first gun designed by Rheinmetall, the 75mm KwK L/60, barely met the requirements: being able to achieve a penetration of 100mm of armor inclined at 30 degrees at a range of 1400 meters. In face of that, Rheinmetall, in order to to ensure that the penetration specificaton was met, developed a longer gun, the 75mm KwK 42 L/70, to be fitted in a new turret designed around this new gun. By July 1 1942, long range plans under Hitler Panzerprogramm II established that the first 100 production series tanks would mount the 88mm KwK 36 L/56 in the Krupp turret. From the 101st tank on in February 1943, production should be shifted to the Rheinmetall turret with the 75mm KwK 42 L/70. This was to be the famous gun that would be mounted on the PzKpfw. V Panther. However, at a Panzerkomission meeting on 14 July 1942, the subject of Tiger armament was discussed again, and it was verified that the ability to penetrate 100mm of armor, under the required conditions, was also achieved by the 88mm KwK 36 L/56, therefore conversion to the 75mm KwK 42 L/70 was no longer necessary, and conversion to the 88mm KwK L/71 would ocurr at the end of the same year. This decision resulted in the entire production run of Tigers being outfitted with turrets mounting the 88mm KwK 36 L/56. As a matter of fact, this increase in the penetration abilities of the 88mm KwK 36 L/56 resulted exclusively from changes to the design of the armor piercing (APCBC) ammunition. Greater armor penetration was achieved by decreasing the size of the explosive filler cavity inside the shell, which also increased the weight to 10.2 kilograms (JENTZ, Thomas L.; Germany's TIGER Tanks - Tiger I and II: Combat Tactics; op. cit.). Behind the decision to retain the the 88 mm KwK 36 L/56 as the main gun of the Tiger I instead of the Rheinmetall 75 mm KwK 42 L/70, was the fact that at that time, armor penetration was mainly a function of thickness to diameter (T/d) ratio. During World War II, the Armor Piercing (AP) round relied on its own weight (and a 88 mm KwK 36 L/56 gun APCBC shell weighed 10.2 kilograms, as opposed by an 75 mm KwK 42 L/70 gun APCBC shell, which weighed 6.8 kilograms) to penetrate the enemy's armor. Theoretically, the higher the muzzle velocity, the more penetration any kind of AP round would have, all other variables remaining constant. In real World War Two tank combat, however, other important variables intervened, such as the thickness to diameter (T/d) coefficient, which means that the bigger the diameter of any given round relative to the thickness of the armor it is going to strike, the better the probability of achieving a penetration. Furthermore, if the diameter of the armor piercing round overmatches the thickness of the armor plate, the protection given by the inclination of the armor plate diminishes proportionally to the increase in the overmatch of the armor piercing round diameter or, in other words, to the increase in this T/d overmatch. So, when a Tiger hit a T-34, the 88 mm diameter of the Tiger's round overmatched the 45 mm glacis plate of the T-34 by so much that it made no difference that the Russian tank's glacis was inclined at an angle of 60 degrees from vertical. 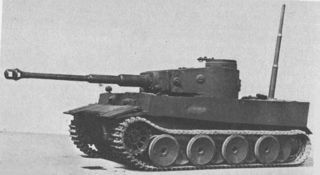 For those facts, the 88mm KwK 36 L/56 was a better choice for a breakthrough tank such as the Tiger, according to German doctrine, as stated in the Manual for Combat and Combat Employment of Smaller Units: "The heavy tank forms the core of the spearhead and their main objective is the enemy tanks and antitank guns that can be eliminated only by using the greater range and larger caliber gun of those tanks. The mission of the first wave is to penetrate into the enemy lines as deeply as possible while the second wave enlarges the penetration, never losing sight of the first wave in order to provide fire protection to that wave" (Source: WILBECK, Christopher W., Sledgehammers: Strengths and Flaws of Tiger Heavy Tank Battalions in World War II). And more: "Armor obliquity-effects decrease as the shot diameter overmatches plate thickness, in part because there is a smaller cylindrical surface area of the displaced slug of armor which can cling to the surrounding plate. If the volume which the shot displaces has lots of area to cling to on the parent plate, it resists penetration better than if that same volume is spread out into a disc with a relatively small area where it joins the undisturbed armor. A plate greatly-overmatching shot involves the projectile digging its own tunnel, as it were, through the thick interior of the plate. It was found experimentally that the regions in the center of the plate produced the bulk of the resistance to penetration, while the outer regions, near front and rear surfaces, presented minimal resistance because they are unsupported. Thus, an overmatched plate will be forced to rely on tensile stresses within the displaced disc, and will tend to break out in front of the attacking projectile, regardless of whether the edges cling to the parent material or not. Plate-obliquity works in defeating projectiles partly because it turns and deflects the projectile before it begins digging in. If there is insufficient material where the side of the nose contacts the plate, stresses will travel all the way through the plate and break out the unsupported back surface. The plate will fail instantaneously, rather than gradually". "You can angle the armor any way you want, and beyond a certain point of a shot overmatching the plate, the obliquity will cease to be relevant. In fact, at certain conditions of shots overmatching the plate, the cosine rule is broken and the plate resists less-well than the simple cosine relationship would predict (LOS thickness is greater than effective thickness). The above only applies to WWII era AP and APC/APCBC, and WWII sub-caliber ammunition. The long-rod penetrators of today are greatly overmatched, but they bring so much energy to the plate that they penetrate by "ablation": in which both projectile and armor behave like fluids. Hollow charge also enters the field of fluid dynamics, with a very thin jet penetrating overmatching armor with ease, regardless of obliquity" (Robert Livingston; excerpts of a response to a question posted on the old "Tanker's Forum (Heavy Metal Website)", back in 1998). The 13. (Tiger) Kompanie, of Panzer Regiment Großdeutschland, reported on the performance of the 88 mm KwK 36 L/56, when their Tigers engaged the T-34: "First round hits were usually achieved at ranges between 800 to 1,000 meters. At these ranges, the Panzer Granate (they are referring to the PzGr. 39 APCBC ammunition) absolutely penetrated through the frontal armor, and usually still destroyed the engine at the rear of the T-34 tank. In 80 percent of the cases, shots from the same range hitting the side of the hull toward the rear of the tank resulted in the fuel tanks exploding. Even at ranges of 1,500 meters and longer, during favorable weather, it is possible to succeed in penetrating the T-34 with minimal expenditure of ammunition" (JENTZ, Thomas L.; Germany's TIGER Tanks - Tiger I and II: Combat Tactics; op. cit.). Many more reports like this one attest to the precedent arguments on the superior performance of the 88 mm KwK 36 L/56 gun. Tiger I, firing at long range. The Tiger I, with its 88 KwK 36 L/56 gun, coupled with superior optics, could accurately hit targets at ranges the enemy could not even aim at. 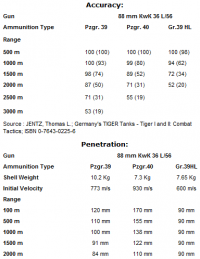 Accuracy and Penetration Tables for the 8.8 cm KwK 36 L/56. The 8.8 cm KwK 36 L/56 was a very accurate gun capable of first-round hits at over 1,000 meters: the Tiger I actually started first-round killing at 1,200 meters, under combat conditions. Considering that the Tiger I was nearly impervious to penetration by most tank and anti-tank guns at normal combat ranges (+/- 800 meters), these were the two main assets (Firepower + Armor Protection) that made it possible for the Tiger I to virtually dominate the battlefield. The long and powerful 88 mm KwK 36 L/56 could out-range and out-shoot nearly all Allied tanks, and this allowed the Tiger I to stand off and engage targets as it chose. On 21 July 1943, General der Panzertruppe Breith, commander of the III.Panzer - Korps, issued the following directive: "Based on experience in recent battles, I issue the following instructions for the cooperation of Tigers with other weapons: As a result of its high performance weapon and strong armor, the Tiger should be used primarily against enemy tanks and anti-tank weapons and secondarily, and then only as a complete exception, against infantry units. As experience has shown, its weapons allow the Tiger to fight enemy tanks at ranges of 2,000 meters and longer, which has especially worked on the morale of the opponent. As a result of the strong armor, it is possible to close to short range with the enemy tanks without being seriously damaged by the hits. Still, the Tiger should attempt to start engaging enemy tanks at ranges over 1,000 meters". According to Jentz (JENTZ, Thomas L.; Germany's TIGER Tanks - Tiger I and II: Combat Tactics; op. cit. ): "These accuracy tables are based on the assumptions that the actual range to the target has been correctly determined and that the distribution of hits is centered on the aiming point. The first column shows the accuracy obtained during controlled test firing to determine the pattern of dispersion. The figures in the second column include the variation expected during practice firing due to differences between guns, ammunition, and gunners. These accuracy tables do not reflect the actual probability of hitting a target under battlefield conditions. Due to errors in estimating the range and many other factors, the probability of a first hit was much lower than shown in these tables. However, the average, calm gunner, after sensing the tracer from the first round, could achieve the accuracy shown in the second column". Please note that 88 mm KwK 36 L/56 means: The diameter of the bore (caliber) of this gun is 88 mm, this is a Tank Gun (Kampfwagenkanone), that the year the development of this gun was finalized was 1936, and that the length of the gun equals 56 times the diameter of the bore (caliber) of the same gun. This measurement was done from the rear face of the breech to the end of the muzzle, not counting the muzzle brake. This was the main gun installed on the Tiger I. As far as the Tiger I is concerned, the two main types of armor piercing ammunition were the APCBC and the APCR. The Armor Piercing Capped, Ballistic Capped (APCBC) round relied not only on its own weight to penetrate the enemy's armor, but was also filled with high explosive that caused great internal damage. The APCBC round has two caps covering the main body of the round. The first one is a cap designed for ballistic performance, and is a blunt cap, because a projectile with a blunt nose has less chance to ricochet off inclined armor. This is covered by the second cap, a sharp one, a "windshield" made of light metal, designed to give the round a better aerodynamic shape. The Armor Piercing Composite Rigid (APCR) round was made with a tungsten core. For flight performance effects and to aid the shot from shattering against armor plating, the APCR round was surrounded by a ballistic cap. The APCR rounds had a higher penetration capacity, but were less lethal than the APCBC after penetration, and also had a shorter effective range. The Tiger I carried 92 rounds of ammunition, although it is known that experienced crews frequently broke the regulations by storing more than that. The recommended and most usual mix was 50 percent APCBC (Pzgr.39) and 50 percent HE (Sprenggranaten - high explosive shells). A few rounds of the rare (due to the shortage of tungsten carbide) APCR (Pzgr.40) ammunition might be carried for use against the heaviest armored Russian tanks and tank destroyers. The Gr.39 HL (Hohlgranate) based on the hollow charge principle (HEAT), was less accurate and much less destructive than the APCBC rounds, but could be carried in place of the HE rounds and used either to combat armor or as effective high-explosive ammunition against soft targets. The sights that equipped the Tiger I up to 1944 were the binocular Turmzielfernrohr 9b mounted parallel and on the same axis as the main gun. The Turmzielfernrohr 9b was an articulated binocular sight, with 2.5x magnification. The range scale was graduated at 100 meter intervals up to a maximum range of 4,000 meters. The commander ordered the target selection, type of ammunition, and range. The gunner observed the tracer and the strike of the round and reported his observations to the commander, who then ordered corrections. To quickly traverse onto a target, the Tiger I was outfitted with a hydraulic motor for the turret drive. The hydraulic drive traversed the turret at a maximum rate of 360 degrees in 60 seconds, dependent on engine speed. Placing the target on the point of a triangle allowed the gunner to aim without obstructing the view of the target. The triangle height and separation distances, in mils, were used as an aid in estimating the range to the target by comparing them with the size of the target. 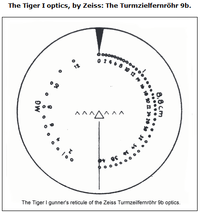 Tiger gunners knew the size of their targets from target tables and later, by practice, instinctively knowing distances. The pattern in the right reticle also contained the 7 triangles plus adjustable range scales that allowed the gunner to register the exact range to the target. The gunner adjusted the range through this sight by lowering or raising the gun to set the aiming sight again on target. The range scale was graduated at 100 meter intervals out to a range of 3,000 meters for the APCR rounds, 4,000 meters for the APCBC rounds, and up to 6,000 meters for the HE rounds. The 88 mm KwK 36L/56 gun had a very-high muzzle velocity and the shell traveled in a stretched arc, which gave the Tiger I more advantages than just penetration power. Besides providing a higher penetration power, it also allowed a higher margin of error in range guessing. The gunner could guess wrong up to 200 meters and still hit the target, since aiming too high simply raised the striking point by less than a meter: too little an error to miss a 3 meter high tank when aimed at its center. From April 1944 on, the monocular Turmzielfernrohr 9c (sighting telescope) replaced the binocular Turmzielfernrohr 9b. This sight allowed the gunner to select two magnifications, 2.5x and 5x. The lower magnification was intended for target acquisition, as it showed a wider field of view. The higher magnification allowed precise aiming at longer ranges. The range scale was graduated in the same way as the Turmzielfernrohr 9b sight; at 100 meters it jumps up to 3,000 meters for APCR rounds, up to 4,000 meters for APCBC rounds, and up to 6,000 meters for HE rounds. Tiger platoons could open fire (concentrated platoon fire) for effect against stationary targets at up to 3,000 meters. When firing against moving targets, the rule was to open fire starting at 1,200 meters and up to 2,000 meters. High maneuverability, low operational mobility. Much have been said about the Tiger's maneuverability, that the Tiger was a "lumbering monster", or that "it could barely move", but that is not exactly the truth. The Tiger I was very maneuverable for its weight and size, and superior to the Sherman in muddy terrain, despite its size and weight, as it had less ground pressure. This capability was provided by the the combat tracks of 755 mm width, which resulted in a ground pressure of 15.0 psi, or 1.05 kg/cm². The Tiger I engine was developed by Maybach-Motorenbau GmbH. Maybach produced the engines for all medium and heavy German tanks. The Tiger's engine, the Maybach HL 210 P45, was a V-12 water-cooled gasoline engine with a capacity of 21.33 liters and a power output of 650 bhp at 3,000 rpm. This engine was mounted in a sealed compartment at the rear of the Tiger. However, it could not be reliably operated at its maximum power output of 3,000 rpm because the transmission, the Maybach OG 40 12 16 A, with 8 speeds forward and 4 reverse, although a surprisingly light set of controls for the driver, had a tendency to breakdown if adequate preventive maintenance was not done. The weight of the Tiger (the combat weight was 57 tons) was too much for the German transmissions available at the time. Since it was not always possible to do this preventive maintenance as required, many Tigers broke down and had to be destroyed and abandoned. The recommendation was that the driver should not exceed 2,600 rpm when operating the Tiger. Only the first 250 Tigers received the Maybach HL 210 P45 engine. In May, 1943, the Maybach HK 230 P45 engine with two air filters was installed, and the transmission was improved. The new engine, also a V-12 water-cooled gasoline engine with a capacity of 23.88 liters, had a power output of 700 bhp at 3,000 rpm. With this upgrade, the Tiger's performance improved in normal use, but the transmission was still weak for/from the stress of the power generated by the engine moving the weight of the tank at maximum output, and preventive maintenance continued to be an imperative. Tigers, like all German tanks, used regenerative steering, hydraulically operated; the separate tracks could be turned in opposite directions at the same time, so the Tiger I could neutral steer (pivoting in place) and completely turn around in a distance of 3.44 meters (11.28ft). This was used to surprise many unlucky enemy crews. As a result of all these facts, the reality is that the Tiger I was not slow at all. The Panzer IVs road speed was 40 km/h and cross-country speed was 20 km/h. The Panzer IIIs (Ausf E to N) road speed was 40 km/h, and cross-country speed was 18 km/h. The Tiger Is road speed was 38 km/h, and cross-country speed was 20 km/h. This fact is evidenced by the following excerpt from the Experience Report of the Tiger Abteilung 506, dated 15 January 1944: "During long term operations, which stretched over 12 days, time for care and maintenance of the Tigers was too short and losses were correspondingly high. On 2 January 1944, the Abteilung went into action with 13 Panzers. Not a single Tiger was still operational on the evening of 14 January. The last two Tigers had driven a distance of about 340 kilometers. Without being given any time for care and servicing, most of them managed to cover 250 kilometers"
But there were still other complications. Given the characteristics of the Tigers as a battlefield superiority weapon, they were constantly being transferred from one point to the other on the battlefield, and even front to front, as "fire brigades". Long road marchs resulted in mechanical problems, and Tigers consumed high quantities of precious gasoline (the Tiger had a maximum combat radius of 195 kilometers, using 540 liters of fuel in the process) thus, the preferred method of movement across great distances was by rail. As the war went on, the German rail net was progressively more and more disrupted by Allied strategic and tactical air attack. This eventually limited transportation of Tigers by rail to the night. Rail movement of Tigers, however, involved more complications, because special cars were required to transport Tigers, and the tracks were too wide for rail transport: narrower ones were fitted for normal road and railway transport, where the outer set of road wheels was also removed. This limited the transfer of Tigers from one sector to another without a great deal of lead time and careful coordination. Beyond the great additional effort by the crewmen that was required, such a complicated transport process took even more time from the Tiger's combat availability. 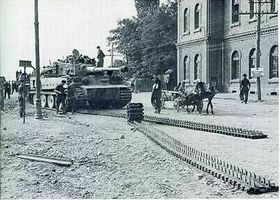 This process led in a heavy logistical burden on the Tiger units, as they had to necessarily maintain two sets of tracks for each tank (WILBECK, Christopher W., op cit). The bottom line is that the Tiger had high maneuverability, but low operational mobility. Tigers were prone to transmission problems if they did not receive adequate periodic maintenance. This high degree of maintenance required to keep Tigers operational was one of their biggest deficiencies, and usually resulted in a low operational rate of combat-available tanks within the schwere Panzer Abteilungen, especially after long marches or extended periods of combat. The tendency of the Tigers to break down, coupled with the weight of the tanks, made recovery of broken down Tigers difficult. The outcome was low operational mobility as a result of those problems, which meant that Tiger units frequently had a very limited radius of action. The Allies exploited this fact during the numerous and frequent operational and strategic withdrawals of the Tiger battalions. That, and the overwhelming Allied air power, were the main reasons for the destruction of Tigers, more than any tank versus tank combat, specially on the Western Front. On the East Front, the main causes of destruction of Tigers were the transmission problems (with consequent abandon and/or destruction by the crews), the Russian air attacks, and being terribly outnumbered and fighting to the very end. Henschel und Sohn, of Kassel, Germany, was a well-known manufacturer of heavy industrial and railroad equipment, especially railroad locomotives and large dock cranes. Because of the size and weight of the Tiger, Henschel was considered to be the ideal manufacturer, having all the facilities needed to produce such a heavy vehicle. Henschel also had a fine engineering staff, and a complete vehicle test facility. The final assembly hall at Henschel's plant dwarfed the tanks being produced there and the final assembly line was capable of producing several tanks a day. Although much of the installed equipment on the Tiger was subcontracted, Henschel manufactured most of the major components in their plant. Hulls, turrets, and other contract items and assemblies were brought into the assembly building where final machining operations and detail assembling were done. 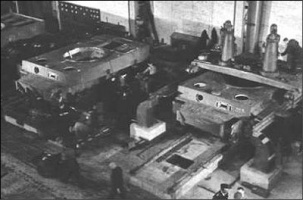 Henschel's facilities allowed the firm to machine the turret rings and other critical areas of the hull within the plant without outside assistance.Like all German Panzers, the Tiger I was subject to continuous changes and additions, as it became obvious that improvements could be made in the performance and effectiveness of the Tiger. Gradually, the various problems reported were worked out, although some were never solved completely. The problems with ice and snow freezing on the interleaved road wheels were not solved until the introduction of the Tiger II with overlapping, not interleaved, road wheels In May, 1943, the Maybach HK 230 P45 engine with two air filters was installed in place of the Maybach HL 210 P45, and the transmission was improved. With this upgrade, the Tiger's performance improved in normal use. In July 1943, the turret was extensively redesigned. 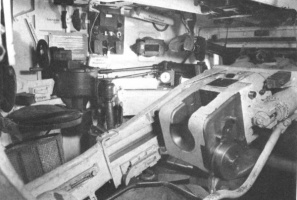 A new commander's cupola with periscopes and a swivel hatch was installed, and along with other modifications, an improved spring counter-balance connected with a chain was installed for the 88 mm main gun. Starting in September, 1943, Zimmerit anti-magnetic coating was applied at the factory to all upright surfaces that could be reached by a man standing on the ground. The surface was rippled to increase the distance to the steel surface without increasing the weight of the coating. From January 1944 on, the Nahverteidigungswaffe (close defense weapon) was mounted on the turret roof. This weapon could fire smoke cartridges, signal cartridges, and grenades, but due to shortages, was not mounted on the Tiger I until March 1944. In February 1944, steel road wheels with internal rubber cushioning, adopted from the Tiger II, were mounted in the Tiger I. These were chosen because of their ability to bear the weight of heavy armored vehicles. From March 1944 on, the 25 mm roof plate was increased to 40 mm, to prevent penetration by large caliber artillery shells (over 150 mm), and the loader's hatch, originally designed for the Tiger II turret, was installed in the thicker turret roof. Finally, in April 1944, The monocular Turmzielfernrohr 9c sighting telescope replaced the previously used binocular Turmzielfernrohr 9b. While the Germans stayed close to their original production schedule for the Tiger, it is interesting to note that, for example, during Operation Zitadelle (the Kursk Offensive - July 1943), there were a total of only 133 Tigers available at the start of the offensive; 45 serving with sPzAbt.503, 13 with 13.Kp.SSPzRgt1 (LSSAH), 14 with 8.Kp.SSPzRgt2 (Das Reich), 15 with s.Kp.SSPzRgt3 (Totenkopf), 15 with 13.Kp.PzRgtGD (Großdeutschland), and 31 with sPzAbt.505. A total of 19 Tigers arrived as replacements during Operation Zitadelle; 5 for 13.Kp.SSPzRgt1 (LSSAH), and 14 for sPzAbt. 505. From 5 July to 20 July 1943, 13 Tigers were lost (total writeoffs): 4 by sPzAbt.503, 1 by 13.Kp.SSPzRgt1 (LSSAH), 1 by 8.Kp.SSPzRgt2 (Das Reich), 1 by s.Kp.SSPzRgt3 (Totenkopf), and 6 by sPzAbt.505. 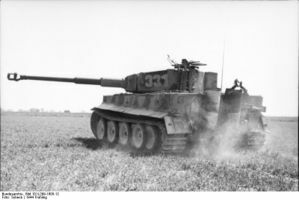 The Tiger dominated the battlefield, and this occurred basically because it managed to maintain a stand-off ability made possible by; a combination of thick armor and a high-velocity, very accurate gun coupled with superior optics, thus being capable of first hits at ranges well beyond 1.000 meters. As it was, the Tiger could choose its targets at will, and destroy them at ranges they either couldn't hit, or if they could hit, couldn't defeat the Tiger's thick armor. The Tiger I maintained this stand off capability until nearly the end of the war, as it was only outclassed by the Russian Josef Stalin (IS) heavy tank. On the other hand, Tigers were maintenance-intensive tanks and prone to mechanic failures if periodic maintenance procedures were not done. Because of that, plus the weight of the tank, they had low operational mobility: a problem that was magnified during retreats, when damaged or broken Tigers couldn't be recovered and had to be destroyed by their crews. By February 1944, sPzAbt.502 had 71 Tiger I tanks. At the same time, sPzAbt.503, 507, and 509 had respectively 69, 56, and 58 Tigers. This was due to transfers from other units training with the Tiger II, or due to the delivery of the last production Tiger I models. Tiger I production reached its peak between January and May 1944. Regardless, the maximum degree of success attained by Tiger units was in limited and/or localized tactical superiority. The truth was that the German industry simply couldn't produce Tigers in sufficient numbers to make any difference in the big picture: it was a task well beyond wartime German industrial capabilities. Just as a comparison on production capabilities, the Russians produced 23,937 T-34/76s from 1942 to 1945. The American Pershing tank was built at a rate of 1,350 tanks over a six month period. When production ceased in June 1945, 49,234 Sherman tanks had been built: more than all the German tank production during the entire war. In the end, it was this difference in production philosophy and faster Allied production that made the difference between defeat and victory. The real failure of the German heavy tank was that they exceeded the capability of German industry to produce them in sufficient numbers. All this said and done, the Tiger was very sucessful in fullfilling its doctrinal mission, to destroy other tanks, and its reputation grew on the battlefield as the war raged on. The basis for this is the kill/loss ratio attained by the Tiger battalions. The overall ratio for all Tiger battalions is a respectable 5.74 to 1 kill ratio. The Tiger I was phased out in 1944. By August of that year, 1,300+ had been made: not many, in view of their reputation and effect on Allied morale. Perhaps this is the best epitaph the Tigers could have. - Germany's Tiger Tanks: Vol. 1 - D.W. to Tiger I: Design, Production and Modifications; Thomas L. Jentz & Hilary L. Doyle. - Tiger I Heavy Tank 1942-1945; Thomas L Jentz, Hilary Doyle and Peter Sarson; Osprey Publishing Ltd.
- JENTZ, Thomas L.; Germany's TIGER Tanks - Tiger I and II: Combat Tactics. - The Tiger Tank; Roger Ford; Motorbooks International Publishers and Wholesalers. Esta página fue modificada por última vez el 25 oct 2016, a las 10:18.